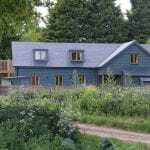 The Old Brooder welcomes families who want fresh air, space to roam – and lovely, eco-friendly farmed countryside. You’ll see primroses peeping, traditional coppiced hedgerows, generous margins to walk the farm trails with woods, ponds, green lanes, meadows (still tucked up for winter), maybe a barn owl hunting and you can borrow our 20 adult bikes and bring your children’s to explore the quiet country lanes – or try our family farm activity pack ideas. At the end of the day you can cook, feast and relax together in the cosy bunkhouse.